When volunteering for the 1984 Olympics, Naomi Saunders saw firsthand how athletes “choked” under pressure. This experience, along with her own as a dancer, — the first Anglo-American member of the Ethnic Mexican Dance Troupe — led the San Rafael resident to explore the mind-body connection in sports. 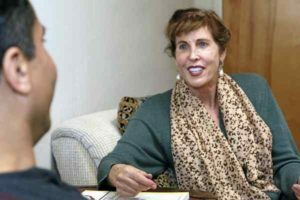 After getting her master’s degree in sports psychology at John F. Kennedy University and training in the Feldenkrais Method and Pilates, she became a mental skills coach for athletes in the U.S. and abroad. Saunders works with athletes on their mental skills, mind-body awareness and core training at her San Anselmo business Movement Max. Q What volunteer work did you do at the Olympics? A I was volunteering at Santa Monica College. We were hosting some of the track athletes and the team handball athletes. It was our job to interact with them and help them with anything that they needed. Q Why do you think mental training is important? A All this physical training that they’ve been doing can help them to a certain point, however, if they go into a competition and they are anxious, or if they can’t focus and be in the moment, they are not going to be able to take advantage of all of this physical training that they’ve had. I watch a lot of tennis on TV and I go to some of the competitions and on any given day, a much lower-ranked athlete can beat a much higher-ranked player. I think the difference is their ability to be able to focus and take one shot at a time. Q What’s a memorable session that you’ve had with an athlete? A An opportunity that I had in Italy, working with a jockey. They have a horse race that goes on there in the summer, and it’s an all-out, 90-second sprint. Whoever is in front, wins. You can imagine the pressure. He didn’t speak a word of English and my Italian is very poor. I had this session with him, with the translator translating, and he and his wife sitting there. In school they talked about that you have to learn how to think on your feet, but boy did I have to think on my feet there. Q What was it like being a part of the Mexican dance troupe? A That was one of the highlights of my life. I somehow talked my way in there, because you’re talking about a provincial place in Mexico where I was seen as an outsider. Q What led you to be in Mexico? A I graduated from college with a major in anthropology and I had just enrolled in a summer school session in Mexico City. One of the women in my anthropology class said, “Why don’t you come down with me [to Palo Alto], there’s a big dance performance going on.” I went and I was smitten with it. I decided I really wanted to learn the dance, so I rented an apartment and lived there for three-and-a-half-years, dancing. It was a small town and a lot of people in town were not in favor of an American being in a Mexican dance troupe, but it helped me to become much more physical and in tune with my body, finding that I enjoyed the dance so much. Success: What Is Holding You Back from Your Dreams? ■Learn to celebrate your small successes. One example is how professional tennis players celebrate after a successful shot or winning a set. It can be as small as a hand gesture; this is still a kind of celebration. ■Formulate realistic and attainable goals with timelines. The goal timeline needs to be flexible enough to allow for adjustment. ■Begin with smaller steps to work toward a larger goal. ■Remember that success, as life itself, is a process, rather than an event. Learning to enjoy all parts should go a long way toward gaining the confidence and experience to continue.